We knew when we made plans to come to New Zealand in May and June that we would not be getting the nicest weather the country has to offer and that has held true. Many days we don't see the sun and it has rained quite a bit as well. back link check But coming to New Zealand in the fall/winter also has been a boon. The roads are near empty most times we're driving, hiking paths deserted and campervan parks nearly vacant. But nowhere has traveling in the off-season impacted us more than wine tasting. Our most disappointing experience so far was in the Nelson Wine Region, where many wineries that claimed to be open either in promotional materials or on their Website, were closed because of the drop in visitors during the winter. We drove a fairly good distance to visit one winery (I won't name names, but it's Neudorf), found that it was open, but the woman would only sell us wine, not open a bottle for us to try. We were sad to miss out on tasting their world-renowned Chardonnay someone told us about later. We would have left the area with a bad taste in our mouths were it not for the superb tasting we had at Woollaston, where we were treated to seven superb biodynamic wines that only scratched the surface of what the winery offers. Woollaston makes wine under its own label, a premium Mahana label and a Tussock label of which some are available in the U.S. An adjoining art gallery from a renowned collector brought me back to my days at Hess Collection. It was also one of our only sunny winery visits and we enjoyed a fantastic picnic on their patio with views of the hills and the Tasman Bay, reminiscent of our famous California winery picnics. Beauty of a view from the Woollaston patio. Being here in the off-season also has given us unheard of access (at least compared with the States) to winery owners and winemakers. Harvest was completed about a month ago and the wine is doing its thing in barrels, tanks or bottles, leaving the principals a little extra time to meet face-to-face with the public. Some of the wineries we've visited have no Cellar Door open for tastings so we've relied on the generosity of owners to open their real doors to us. 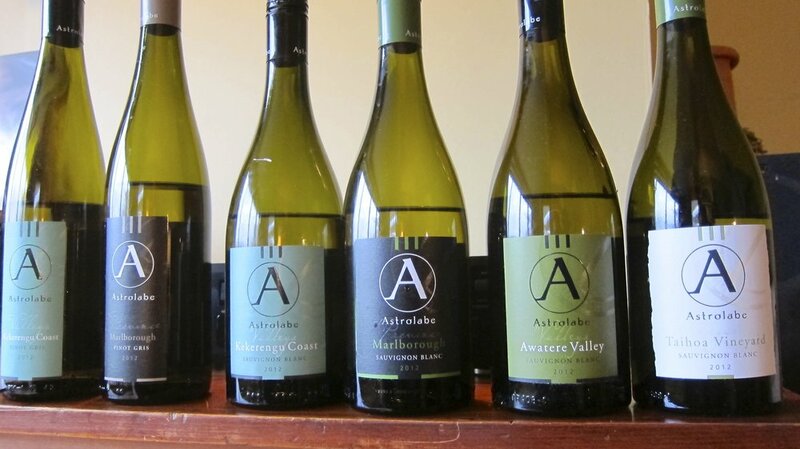 By far our most fantastic experience came at Astrolabe Wines in Marlborough. Owners Simon Waghorn and Jane Forrest-Waghorn graciously opened up their house to us, then spent the next hour and a half going through a good portion of the winery's portfolio of 17 wines. Marlborough is world-renowned for its Sauvignon Blanc and Astrolabe makes a number of them, but Simon's interests lie in the different sub-regions of Marlborough and the differences that each area brings. His wines have all the fruit you would expect from Sauvignon Blanc in the region, but are more subtle than many, but with much complexity. Astrolabe distributes in the States through Cannonball Wine Company in California, though you unfortunately won't be able to taste the whole range, only a Sauvignon Blanc, Pinot Gris and Pinot Noir. Track some down! An incredible Astrolabe line up. Other highlights in Marlborough, included a delicious tasting at Seresin Estate (another producer of bio-dyanmic wines), and seeing the sprawling 1,000 hector estate of Yealands Wines perched above the coast. We also visited the king of Marlborough Sauvignon Blanc, Cloudy Bay, but were treated like paupers. Save your money and buy two bottles from another lesser-known producer. Yealands vineyards, as far as the eye can see (even on a cloudy day). We also had one of the more random encounters I've ever experienced. I ran into a former colleague from Hess Collection, Scott Shirley, while tasting at Framingham Winery. Scott now works for Justin Vineyards in Paso Robles and was doing research on Sauvignon Blanc for his winery so make sure to check out some Justin Sauvignon Blanc in the coming years to see what tips he picked up. Surprisingly, most wine people in New Zealand I've told about this encounter aren't surprised by it, saying that choice meetings between people often happen here and that the wine world is actually much smaller than you would think. Next up -- Martinborough and Hawke's Bay on the North Island! Let's hope for some nice weather!